Almost 150 years ago, busy Spanish colonizers were establishing the pioneer community of Reynosa on the south bank of the Rio Grande (they called it the Rio Bravo del Norte- and still do), first of a string of northern Mexican settlements that eventually included Laredo, 150 miles up-river. 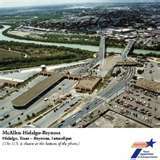 Now grown to a modern metropolis of 1.2 million, Reynosa is McAllen's sister city on the Mexican side of the border, and a great place to spend a few hours bargain hunting, enjoying lunch or dinner at one of many fine restaurants, or simply relaxing with a tropical beverage at a simpatico watering hole. Most of the new friends (amigos) you'll find in Reynosa speak English, but this would be a good opportunity to test your rusty high school Spanish, even if it's just to say �por favor� or �gracias� (please and thank you). If you don't care to drive your car into Mexico, you can park it for a modest fee on the US side and walk across the bridge. Shops and restaurants are within a block or two of the bridge, the main plaza is just a few blocks away, and pedestrian hidalgo Street and the Zaragoza market are just beyond the plaza. If you drive across, just be sure you have Mexican insurance- easy to obtain and inexpensive on the US side. Currently, you don�t need a visa if you're a US or a Canadian citizen, but bring along proof of citizenship just in case. And enjoy! Reynosa, Tamaulipas, Mexico, is McAllen's twin city with McAllen being a principal city along the United States - Mexico border. Reynosa is a dynamic and business-oriented city located at the north of the MexicanRepublic. Reynosa is situated at an elevation of 36 meters above sea level and is approximately 40 square kilometers in size. It is located 5 miles south of McAllen -- just across the Rio GrandeRiver. These two interdependent communities are joined by two international bridges and soon a third that allow economic and cultural exchanges on a daily basis. Reynosa has a diverse economic base which includes oil and natural gas resources, livestock, agriculture, tourist trade, and industry. Reynosa enjoys a sub-tropical climate with an average annual temperature of 74 degrees Fahrenheit. Average annual rainfall is 26 inches. Reynosa has 8 major hospitals, 6 private health clinics, 8 public health clinics, one federal health center, and the Mexican Red Cross. Reynosa also has numerous private medical offices that provide health services in all major fields. Reynosa has approximately 325 schools ranging in curriculum from kindergarten to college. There are 4 universities, 1 technical institute and 6 technical training centers. A variety of social clubs and organization serve Reynosa: Lions Club, Rotary Club, Pan American Round Table, Attorneys Club, Friendship Club, Musical Culture Club, Social Club of Reynosa, Medical Association, CPA Club, Reynosa Merchants Club, and the Reynosa Hunting and Fishing Club. Tourism is a very important part of Reynosa's economy. The Reynosa Tourist Department estimates that 3,000 U.S. tourists visit Reynosa daily. "Winter Texans" increase this figure by approximately 20% during the winter months that they reside in the Rio GrandeValley. Reynosa has several hotels ranging from 2-5 stars, totaling over 3,500 rooms. Reynosa has ten industrial parks which are the home to over 200 manufacturing plants. Global leaders in electronics, apparel, medical supply, publishing, auto assembly and many other fields have established large operations in Reynosa. These manufacturing plants employ approximately 75,000 people under the maquiladora program.